The boys and I had a great time this Valentine’s Day. First and foremost, John got home from a three night trip late last night, so first thing this morning the kids woke up to seeing daddy! Then it was pancakes and sausage, getting dressed, and off to school. While Jack was having so much fun, I decided Grayson deserved something special too, so we headed to Schlotzsky’s to pick up a sandwich, chips and cookie. 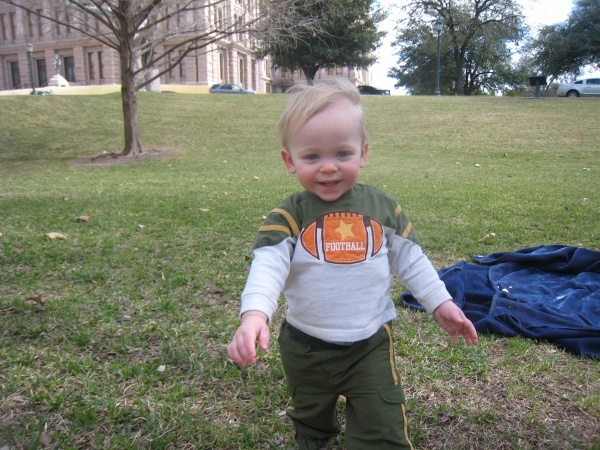 Then we headed for the Capitol, which is right across the street from our Church and Jack’s preschool, for a picnic. We sat and ate together on our blanket. Grayson was very hungry, as usual. Then I sat and watched him run around. It was so wonderful, the weather was perfect. We couldn’t have asked for a better day. See more pics here. After picking up Jack we headed home and all had naps. I even took a nap which is pretty rare these days. When the kids woke up we went through all of Jack’ valentines from school and everyone had a lollipop. When John got home (with a rose, champagne and cheesecake in tow) we cooked a delicious steak dinner and enjoyed spending time with the boys. Then it was more presents from mommy and daddy, nana and papa, aunt peggy, and one more lollipop to get thru bath time. We couldn’t have dreamed up a better valentine’s day!